Environmental Working Group’s lab tests that detected toxic chromium-6 contamination in U.S. tap water have drawn protests from some in the water industry. We’re surprised the utilities are surprised. As far as we know, EWG’s investigation is the broadest publicly available survey of drinking water contamination with chromium-6, a suspected carcinogen. The results of our survey, released last December, were provocative and troubling: 31 of 35 city water supplies were contaminated with chromium-6, all at significantly higher concentrations than California’s voluntary safety “goal” of 0.02 parts per billion in drinking water. But EWG’s study, it turns out, is not the first to attempt to assess chromium-6 pollution across the country. That distinction goes to the public water industry itself. As few outside the industry know, in 2004, the Water Research Foundation, an offshoot of the American Water Works Association formerly known as the Awwa Research Foundation, obtained data on 341 source water samples from 189 utilities in 41 states. The conclusion: chromium-6 is common in groundwater. Chromium-6, also known as “hexavalent chromium,” is often called the “Erin Brockovich” chemical, after the crusading legal assistant who helped residents of tiny Hinkley, Calif., win a $333 million settlement from Pacific Gas & Electric Co, accused of dumping the chemical in local groundwater. Actress Julia Roberts won an Oscar for her portrayal of Erin Brockovich in the 2000 film of the same name. The 2004 industry study, which EWG obtained from a source and cited in a December 2010 report, Cancer-causing Chromium-6 Pollution in U.S. Tapwater, demonstrates that chromium-6 pollution was not confined to California. The numbers for untreated and treated water are not directly comparable. Even so, the two studies, read together, paint a picture of coast-to-coast chromium-6 pollution. The industry study, though clearly relevant to the current debate over what to do about chromium-6 in drinking water, has received scant attention. The Occurrence Survey of Boron and Hexavalent Chromium is sold to water utilities and their consultants, who pay four or five-figure subscription fees to the foundation, then a document fee of around $300. (It can now be bought online for $200 or more.) A map on page 35 of the Water Research Foundation's report shows where the tests were conducted. 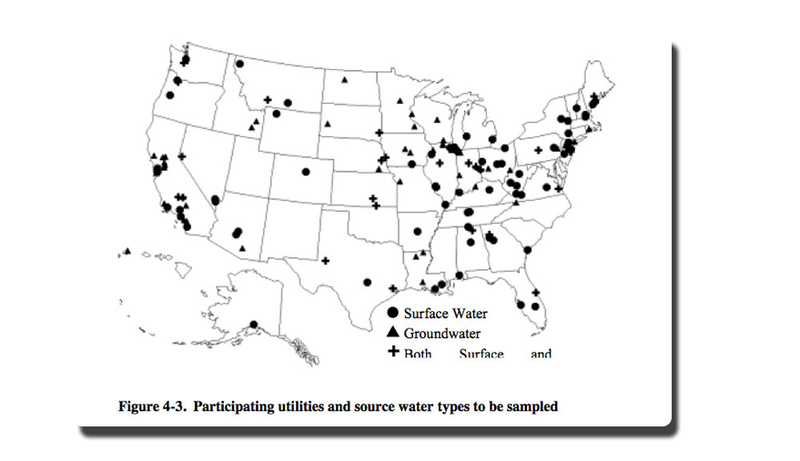 Source: Occurrence Survey of Boron and Hexavalent Chromium, Awwa Research Foundation, 2004 (Awwa Research Foundation is now known as the Water Research Foundation - http://www.waterrf.org/Pages/WaterRFHome.aspx.) Industry representatives did not mention their research group’s findings last month when Sen. Barbara Boxer, chair of the Senate Environment and Public Works Committee, summoned them to testify, along with EWG President Ken Cook, about chromium-6 water pollution. What city water source waters were tested? What were the individual results? Was there follow-up testing of source waters and also drinking water drawn from those source waters? Does the Water Research Foundation plan to share this information with the public, and if not, why not? Has the association conducted similar surveys of source water or drinking water contamination involving other chemicals, regulated or unregulated? If so, what were the results of those surveys? Were they communicated to water utilities and to the general public?